​First things first. The following post has absolutely nothing to do with sports health or performance. I write this post to share some of my thoughts and with the hopes of enlightening others. I was recently informed by a family member that the infant (less than a year old) of "a friend of a friend" recently sustained a skull fracture from falling out of a Bumbo chair. Tragic news? Yes. Preventable? In my opinion, also likely yes. Some of you may already be aware of my opinion of these chairs. To be clear, I take absolutely no issue with the chair itself. I think they're cute and I think they can be a valuable asset to a parent spoon feeding their child. My problem with them, however, is that I truly feel that many children who use them - or at least their care givers who place their children in them - have yet to develop the physical "right" to do so. Several weeks ago it was brought to my attention that these chairs had been recalled for safety reasons (please see this article). Apparently, there were a number of reports stating that infants had been falling out of them, sustaining injury. Not dissimilar to the child I had mentioned above. Now while the purpose of this recall was to make these chairs "more safe" through the use of restraints - aka seatbelts - in my opinion, such modifications are still insufficient. Please be aware that I have yet to have the privilege of being an actual parent. So I understand if my concerns may not resonate very well with those of you who are. 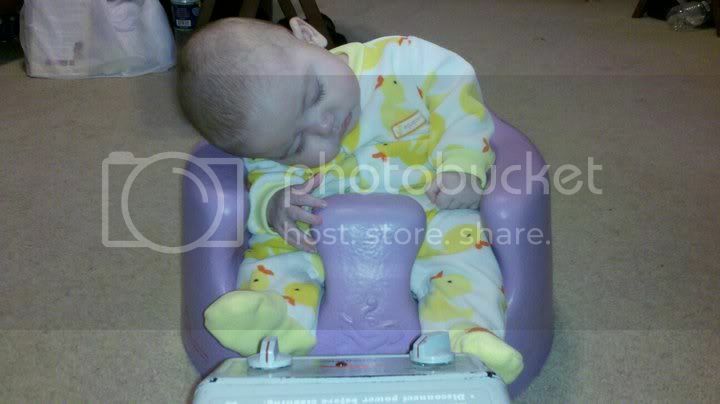 In essence, I believe that infants must deserve the right to be able to sit in such chairs. Reason being is that I have seen many children who have yet to possess adequate weight bearing stability and motor control to do so. A 3month old in a Bumbo is like a tent without poles. Consider this. When attending an amusement park, very few individuals would challenge the stipulation that an individual must be of a certain height in order to be able to ride a certain roller coaster. Naturally, the rationale for this is safety. Now consider a child who has yet to develop the stability and control to be able to hold themselves upright. Without question, their parents would likely be hesitant to leave such child sitting alone, unsupported, on a chair at the kitchen table. And although the Bumbo chair may indeed provide some external support, like the roller coaster, sometimes it may simply be too early. Being trained in a rehabilitation approach originating from Prague and grounded in principles of developmental kinesiology and postural ontogenesis, I have attained a better understanding on the importance and necessity of motor control in developing postural stability. And without question, the first year of life is one in which we humans develop most rapidly. From laying on our backs and stomachs during the first 3 months to standing independently by approximately 10 - 12 months, each of us reaches a certain developmental milestone prior to proceeding to the next...in an ideal world! ​For example, prior to standing independently, babies usually learn how to stand with support. Prior to standing with support, babies usually learn how to upright themselves into a standing position with support. Prior to uprighting themselves into a standing position with support, babies usually learn how to sit upright with support. Prior to sitting upright with support, babies usually learn how to support themselves in an all fours position...and so on. Surely, developmental stages may be individual specific but my point is that certain milestones must be met prior to proceeding onto the next. And many of such milestones are (postural) stability and motor control dependent. And because of this, my opinion is that many infants today lack the postural stability required to be able to sit in Bumbo chairs relatively safely. Please click on this link to see an example. If they're not ready, they're not ready. But please don't get me wrong. I do not think Bumbo chairs are dangerous in and of themselves - although prolonged sitting in such chairs may negatively affect both structural and motor development later in life. My concern is simply that children may not yet be ready to do so. My concern is also that far too often, parents fail to put their children in environments that can allow them to develop, grow, and mature physically. Not only are we as a society sedentary, but so too are our children. Because rather than seeing children freely navigate their way in this new world on the ground, I see far too many children spend most of their 24 hours constrained in some sort of fixed apparatus. Bumbo chairs, car seats, bouncy chairs, jolly jumpers, exersaucers, etc. Again, I understand that parents are busy and parenting is not easy. I get it. I truly do. But please trust me when I say that "scooting" and not being able to walk at 12-14 months is not normal. Wait, in today's society it IS normal. But it is NOT ideal. Yes they will get it eventually. At least I hope. But they won't without proper stimulation. And constantly sitting constrained and being carried, unfortunately, is not stimulation. Rolling around on the floor is.